Tigh na'Tilleadh is in the hamlet of Polbain (The White Pool) overlooking the Summer Isles on the Coigach Peninsula some twenty-five miles (40 kilometres) to the north-west of Ullapool in Wester Ross in the Highlands of Scotland. The area is remote, but then that is its charm. The Tigh, the old spelling of "house" in Gaelic, is the main building on the half acre of land it shares with our wee letting cottage, Bothan na'Tilleadh, originally the byre. The house is our own and stands on the same piece of ground as our smaller letting cottage, Bothan na'Tilleadh. It has been over the last few years re-furbished and comfortably furnished. It consists of three bedrooms, a bathroom with power shower, a living room with an open fire, an open-plan hallway and dining room and a newly re-modelled and equipped kitchen. The house is reached by steps from above through a gate onto the road opposite Polbain Stores. 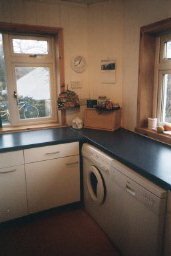 It has mains electricity, its own spring supplying water with mains back-up, full oil-fired central heating and water heating plus combined gas and electric cooking. All electricity, water and gas are included in the cost of rental. The accommodation is to a high standard and is suitable for up to eight people. It is ideal for five adults or a family with up to four children in the three bedrooms and an additional two adults can be accommodated in the sitting room on the fold-down sofa. The main bedroom has a double bed. The second bedroom has two single beds with space for a third fold-down single. The third bedroom has a single bed, whilst the sitting-room has a double sofa bed. Sheets, duvets and duvet covers plus pillows and pillow slips are supplied and again included in the cost of rental. A cot is also available on request. All the bedrooms are panelled and have central-heating and new, double-glazed windows. 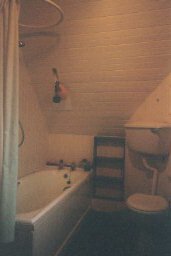 This is a bathroom/toilet on the first floor. It is fitted with a bath, a very effective power-shower and extensive clothes-drying facilities. The water is heated by the oil-fired central-heating system with the back-up of an immersion heater and, in winter, the coal fire in the sitting room. 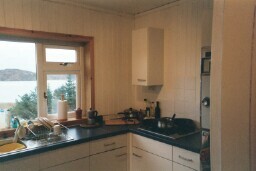 The kitchen has been recently fully refurbished. It is fully equipped with a Calor gas stove, electric oven, a washer-dryer, dishwasher, plus toaster, kettle, coffee maker and microwave. There is a refrigerator and a freezer in the kitchen. The dining room, which also serves as a study, again seats up to eight round a large wooden table. It is open to the hall-way. For babies there is a high-chair available, which can be turned into a toddler's chair and table. There is also a broadband Internet connection. The living room is across the hall from the dining room but not open to it. Comfortably furnished it has satellite television, stereo CD and tape recorder and a piano. It contains a double sofa-bed and also has an open fire-place, for which there is a supply of coal and wood. To the side of the Tigh there is a large patio. There is a small lawn in front, where there is a large childrens' climbing frame. Much of the rest of the garden is left semi-wild and the paddock is left completely wild. We have, especially in summer, a wide variety of bird life including hawks, and a remarkable variety of butterflies and moths. To encourage them we leave as much of their potential habitat a possible. The midge can be the scourge of The Highlands but we, because we are close to the sea, have little problem except some evenings at dusk. Hot water in the Tigh is both by central-heating system and the immersion heater. Heating throughout the house is by radiators, controlled by a thermostat in the hallway. As people who have lived in Southern Europe and even in the Tropics at various times we have over-specified that the heating to ensure we, our family and all our guests remain warm at all times. All the costs of heating and hot water are included in the rental. Beds are all made to your specification on your arrival. We can offer double and single beds. All bed-linen, bath-, face- and tea-towels are always included in the rental and are changed at least weekly. here are the prices and the seasons but read this note first. a car you may be able to deduct 15% from your rental. Cycling and Cycle Hire: The Coigach Peninsula is ideal for leisurely cycling, as long as you do not mind a hill or two. Cearcall na'Coigach (The Coigach Ring Road) in either direction offers some of the best view in the Highlands. Clockwise you have views of the Summer Isles. Anti-clockwise you have the panorama of Beinn Mor Coigach, Beinn a'Eoin, Stac Pollaidh, Cul Mor, Cul Beag Suilven and Canisp. The Autumn on the Coigach is a much underrated time of the year for walking or just taking a break away from it all. The colours of the trees and the heather around Lochs Bad a'Ghaill and Lurgainn and along the coastal road to Lochinver are at least as good as those in New England in the USA or in Eastern Canada. The weather on our peninsula is also often very mild at that time. The surrounding seas seems to create a warmer micro-climate not enjoyed just a few miles inland. In the first half of October the days are still long, the weather can be warm and pleasant and the ground underfoot still dry. At night, when conditions are right, there are the marvels of the Aurora Borealis. The end of October and November can be stormy but the colours are often at their best, ochre illuminated morning and evening by the low sun. We have created some special pricing for the last week of September, October and November. For more details click on AUTUMN COLOUR. Christmas is a quiet time of the year in the Highlands. Hogmanay - New Year - is our time for quiet celebration. It means that both Christmas and Hogmanay are ideal times to have a few days away to celebrate in quite intimacy. Again we have put together some special Christmas and New Year pricing, details of which can be found by clicking on CHRISTMAS or HOGMANAY. From the beginning of December until the Easter the landscape of the Coigach transforms itself. The seasons change but the hills and the moors are still there for walking. The beaches are still empty and the sheep still graze. We do not pretend that at times the wind does not blow, that the rain does not lash in across the Minch or waves crash against the Summer Isles. Such days have their own pleasures, if you are tucked up in the warmth and comfort that our bothy offers, perhaps with a good book and a dram. However, as often as the winds blow there is the other side of the Highland winter - calm days of milky sunshine, when the snow can glisten on the peaks of the Coigach, from the house snow can be seen on the peaks of Skye, Harris and Uist and there is complete quiet. We have put together a specially priced packages for the long-weekend, details of which can be found by clicking on WINTER . "Getting Here" & Car-Hire Offer ! Getting to us with a car is not a problem. Getting anywhere in the Highlands, when you have no car, can a problem. We appreciate that. We in Polbain have a bus that stops right at our door and that may make your holiday with us possible but we also have one further offer. We appreciate too that it is a long drive to us from the South of England and Wales and still more from Continental Europe. We are 630 miles from London and do not try to hide the fact. That is one reason we are unique in landscape and culture. We think the drive is worth it and we want you to come. Many of our guests make the journey over two days with an overnight stay on the way. Others look to fly from wherever they stay in the World and then hire a car at Inverness, Aberdeen, Edinburgh or Glasgow's airports. We understand that care-hire is not cheap. Its extra cost may make the difference between you coming to us or holidaying elsewhere. We want you to stay with us and to encourage you to do so we will at any time of the year give you a 15% reduction in all our rental prices, except our "Specials". All you have to do is provide us in advance of your final payment to us a copy of your car rental agreement and pay us by the due date by cheque, either in Sterling or Euros. We also have available for rental our bothy, which comfortable taks two people and can take up to 4. For more information, click on Bothan . 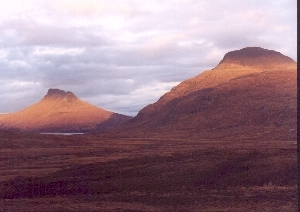 It is said that the Coigach has something of a charmed weather record. Noone seems to know why. Perhaps it is is because we are sheltered from the full swell of the Atlantic by Lewis but not so sheltered that we do not enjoy the full effect of the Gulf Stream. Perhaps too because we are a fairly flat peninsula, reaching out into the Atlantic for 15 miles with high mountains at the eastern end, the worst of the weather passes over us because getting trapped on the those mountains and letting loose its rain. Perhaps the tunnel effect of the fjord-like Loch Brooms also carries the weather away from us before again hitting the high mountains. Noone has satisfactorily explained why the Summer Isles are so called but not infrequently there is blue sky over the Coigach as you reach Loch Osgaig and emerge from rain in the mountains. That is not to say that we stay on the Costa d'Ecosse. This is still the West Coast of Scotland. Nor can you have a precise picture of our weather. The closest we can get are the forecasts for Ullapool and Stornaway. Average them and you will just about have the right picture. They can be found by clicking here on BBC Scotland Weather. Having talked to us we will give you a one week provisional booking and will invoice you by e-mail, fax or post, letting you know, whether you need to pay a deposit and when to pay the balance, or to pay the full amount. There are various ways, in which you can pay, which we will explain to you. As well as cheque and Eurocheque you can pay by bank transfer to our Euro or Pound Sterling accounts. Click here on Coigach to find out about our peninsula. Click here on Polbain to learn more of the village.